• hands-on healing –a Japanese energy healing technique called Reiki that helps people achieve a deep state of relaxation where the body heals itself. I also teach Reiki, which can be used for self-healing as well as healing others. A typical healing session runs an hour to 90 minutes, depending on your preference. All three healing modalities are done fully clothed without oil – Cranial Sacral Therapy and Reiki on a massage table, shiatsu on a cotton mat on the floor. I also offer sessions in which I combine these healing approaches. I have a studio in downtown Santa Barbara and also do outcall sessions in people’s homes upon request. Cranial sacral therapy uses extremely light touch to relax tension in the body. The goal of a session is to release restrictions in the body-mind and enhance the functioning of the central nervous system, which in turn helps all of the body’s systems function more efficiently. A session relaxes the body’s connective tissue, or fascia, which frequently hold deep compensatory patterns that develop in the aftermath of a serious injury or accident. Because a session essentially “resets” the central nervous system, most people experience cranial sacral therapy as deeply expansive and relaxing. It has also been found to help children with autism, people with Parkinson’s disease, and other neurological disorders. This technique enables you to consult your own inner wisdom about a condition or ailment and discover how best to heal yourself. Called SomatoEmotional Release in the Upledger Institute school of cranial sacral therapy, it directly consults your “non-conscious,” which can be variously identified as one’s “Inner Physician,” “Higher Self,” or intuition. After you reach a very deep state of relaxation in a cranial sacral session, open-ended queries are directed to your Inner Physician, Higher Self, or even a specific body part to discover information that can help you heal. Essentially, it is a dialogue between you and your deepest wisdom; I have no idea what information is available for you, I simply facilitate a dialogue during which you discover it. The information can shed light on the emotional component of an injury, provide specific recommendations for healing, or give you a deeper understanding of an injury or accident. The technique is understood to help release the cellular memory of a physical and/or emotional trauma and thus dissipate chronic patterns that developed in its aftermath (e.g., one leg taking over more of the work of standing and walking after a fall hurt the hip of the other leg). Although not for everyone, the technique is not as “woo woo” as it sounds. It can be highly illuminating and provide extremely useful recommendations on how to recover. Provided that you are open to the dialogue process, it can be surprisingly effective. One benefit is that the technique is not intrusive, open-ended questions are used without any predetermined goal. Moreover, it helps people who feel they can’t “hear” their intuition discover a reliable way of consulting it on their own in the future. 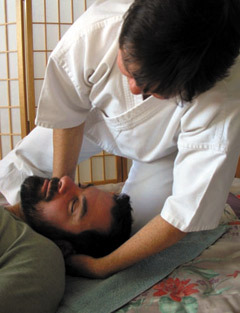 I practice a type of shiatsu that includes a number of passive stretches and a gentle, energetic give-and-take between the practitioner and receiver. Rather than press my thumbs into acupuncture points with all my might and force your body to relax, I use the weight of my body to lean into acupuncture meridians. The more tense you are, the more relaxed I am. You are invited to participate by opening to the amount of pressure that is comfortable for you. That way, the massage is never painful, even though it may work the body very deeply. As a preventative health practice, shiatsu rectifies energetic imbalances that, left unattended, could develop into illness. It is also effective for unlocking chronic conditions, such as recurring headaches, lower back aches, shoulder pain, digestive troubles and anxiety. Shiatsu is also an excellent massage for athletes who do very intense exercise, such as long bike rides, squash, marathons, spinning, etc., because it does wonders to release tension in the deep muscles. It is also very effective for people recovering from serious illness or surgery. The same techniques are used in a very gentle manner to restore energy levels and invoke the body's natural healing response. Reiki is a profoundly relaxing form of hands-on healing. A receiver generally experiences it as heat transmitted through the practitioner’s hands. It allows a receiver to reach a deep meditative state where the body accesses its own healing power. It is an excellent complement to western medical treatment of any kind. Reiki is commonly translated as “universal life energy” and was discovered by Mikao Usui (1865-1926) of Japan in the early twentieth century. It is the force that flows through all things in the universe; a Reiki session allows you to access that energy in concentrated form. A typical session lasts about an hour and consists of me putting my hands on the body of the receiver in several positions on the head, upper torso, upper back, knees, and feet. The receiver is fully clothed and lies on a massage table. I have given hundreds and hundreds of hour-long Reiki sessions. As a result, I have a deep connection with the energy and am able to work effectively with you in our very first session. People experience Reiki differently. Many describe it as intense heat, shimmering waves of energy, a flow of energy, or as a deep meditation. Reiki alleviates pain, relieves anxiety, speeds recovery from surgery, helps depression, and brings individuals greater insight into their own healing. It is particularly effective for people who cannot physically tolerate vigorous bodywork, but would benefit from relaxing, healing touch. “Only after completing my Reiki training with Peggy did I understand its ease and practicality. It's a profound, yet easily accessible energy that practically anyone can learn. 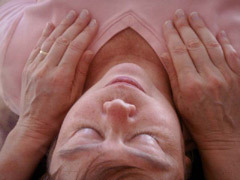 Reiki is typically taught in three levels: Reiki I, Reiki II, and Reiki III (Master Level). I offer both individual and group classes at all levels; I also offer special packages to families living with serious illness. All classes are taught in two sessions, with roughly a week in between. This gives you a chance to go home, practice, and acquire some experience, then come back with questions and deepen your learning. After completing a class, students are encouraged to join a monthly Reiki Circle where Reiki practitioners come together to give one another group treatments. These evenings are devoted to bringing Reiki practitioners together to give each other group treatments. Living with a life-threatening illness or recovering from major surgery is challenging. It is often a source of exhaustion and great anxiety for the person who is ill, particularly when chemotherapy and radiation are involved. At the same time, caregiving can be demanding and stressful for the family. Reiki gives everyone – patient and caregivers alike – a healing tool that they can use to maintain their energy and spirits. It can also greatly speed recovery from surgery. As a hospice volunteer here in Santa Barbara, I am constantly struck by how useful it would be if patients and their families knew Reiki. So I’ve put together a package of Reiki treatments and a Reiki class for families living with serious illness or recovering from major surgery. I am a certified massage therapist in the State of California with almost 700 hours of training and have been working as a healer since 2001. A graduate of the Ohashi Institute in New York City, I completed over 400 hours of classes in traditional Japanese shiatsu. I have completed four out of the six core courses of Cranial Sacral Therapy with the Upledger Institute (Cranial Sacral Therapy I and II; SomatoEmotional Release I and II), and continue to attend classes at the Institute. 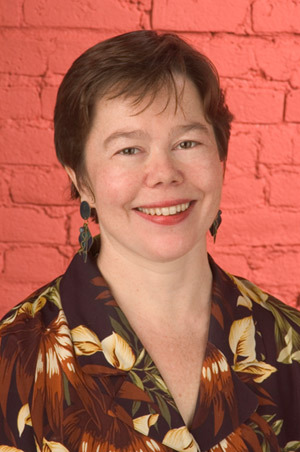 I received Reiki I and II training from Petra Timmermans, a Reiki Master in the lineage of Usui-Hayashi-Takata, and a former Board Member of the Reiki Alliance. Ms. Timmermans is a student of Phyllis Lee Furomoto, the granddaughter of Hawayo Takata, the woman who brought Reiki to the United States. I have taken Reiki Master-level training twice, once with Rama Seltzer, an independent Reiki Master in Santa Barbara, and once with William Lee Rand of the International Reiki Training Center in Michigan. Other training includes Touch for Health with Phil Selinsky, the Yuen Method with Dr. Kam Yuen, workshops with Jeffrey Yuen (an acupuncturist and Taoist priest), Zero Balancing I with Dr. Fritz Smith, and volunteer training with the Hospice of Santa Barbara. I have been a hospice volunteer for 8 years and a Buddhist meditator for 11. In addition, I am a longtime practitioner of yoga and Qi Gong and studied ballet and jazz for many years. My formal education includes a B.A. (New York University) and M.A. (Johns Hopkins University). I speak French and Russian in addition to English.